Update: the WinUSB fork is now called "WoeUSB". WinUSB is a tool that can be used to create a bootable USB Windows installer from an ISO or a DVD, either using a GUI or from the command line. The application looks pretty much abandoned, with the latest release dating back to 2013 however, GitHub user slacka forked it, fixed most of its bugs, and updated it to support both wxWidgets 2 and 3. A few months ago I tried using the original WinUSB to create a bootable Windows 10 pendrive, but it failed. I'm not sure if that's because of the changes in Windows 10, in Ubuntu (which I used to create the USB) or both, but using slacka's WinUSB fork worked, although I did encounter a small issue (see below). The error doesn't occur when creating a Windows USB stick using WinUSB from the command line. I should add that I only tested the WinUSB fork with Windows 10 on Ubuntu 16.04, but it should work with Windows 7 and Windows 8 / 8.1 (and older Ubuntu versions) as well. Also, I performed the Windows 10 installation in VirtualBox, and not on real hardware. 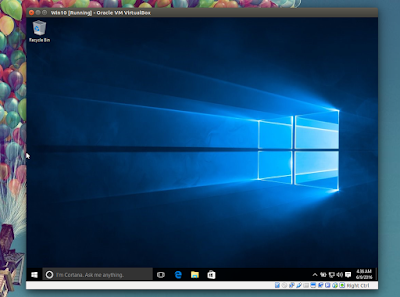 If you want to test the bootable Windows USB you've created using WinUSB fork, before installing it on real hardware, you can use VirtualBox. To be able to boot from USB in VirtualBox, see THIS AskUbuntu answer (make sure your username is added to the "vboxusers" and "disk" groups, or it won't work - you'll find the commands to do this in the AskUbuntu link above, under "EDIT"). Arch Linux users can install slacka's WinUSB fork via AUR. For other Linux distributions, download it from GitHub. 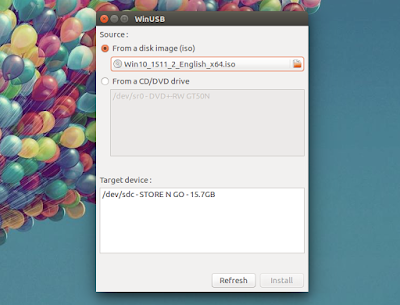 The original WinUSB is also available in a PPA (provides packages up to Ubuntu 14.10 only!). Simply launch WoeUSB from the menu / Dash, select the Windows 10 (again, it should also work with Windows 7 and 8 / 8.1) ISO or DVD,, then select the USB drive under "Target device" and click "Install". Remember that you may encounter an "Installation failed! Exit code 256" error (see THIS) while using the GUI (however, in my test, the bootable Windows 10 USB worked despite of that). If you want to create a bootable Windows USB from the command line, you must first determine what the USB physical drive is. You can easily find this out from the WinUSB GUI (you'll find it under "Target device" - in my case it's "/dev/sdc"). You can also find the device using GNOME Disks, or from the command line, using "lsblk" and so on. Important: make sure you use the correct USB device because it will be formatted!